No traffic, no streetlights, no direct commercial mainland air traffic, and no crowds? Approachable by ferry from Maui, small aircraft from Oahu, and private air and watercrafts, preserves the privacy and less traveled environment. The island of Lana’i is often misunderstood these days. With the recent new ownership of a large portion of this mostly uninhabited island, many buyers believe there is nothing to buy. 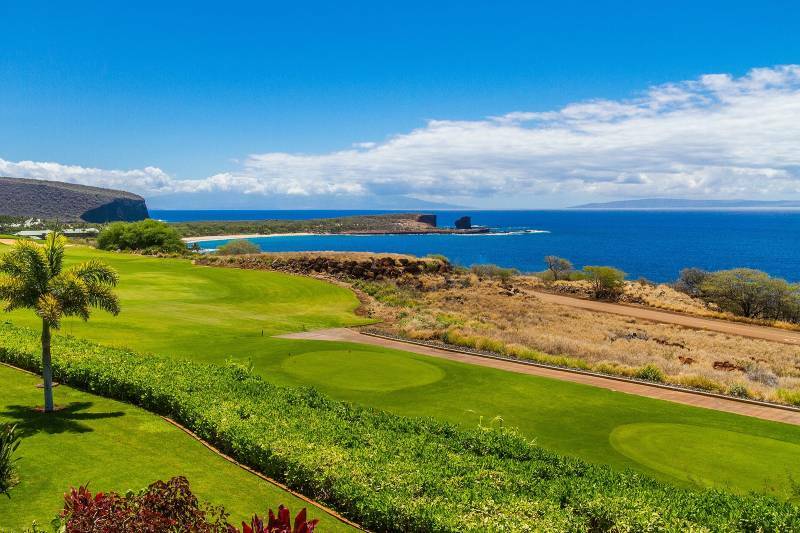 In fact, not only can you own a luxury condominium, house, or land in the Manele and Koele District of Lana’i, but it comes with the option to become an Island Club Member with privileges to the two Four Seasons Resorts and Club Amenities, such as unlimited golf. Lana’i Golf is a magnificent course that follows the coastline above the crashing waves and offers a very “challenging” game; however, five different tees accommodate all levels of play. Resort guests and Club members have unlimited play, and a few tee times offered daily to non-resort guests. The Four Seasons Resort at Manele underwent an extensive renovation a few years ago and includes a Nobu Restaurant as one of its four dining options. The Palms Condominiums, overlooking the 18th fairway and NO ROOFTOPS, includes 180-degree views of the ocean and Lana’i’s iconic Sweetheart Rock. MLS 378399 is the largest unit at 3 bed/3.5 bath, second floor master suite includes private lanai and sitting room. A two car garage and gated courtyards are part of The Palms and all Terraces Condos in Manele, making this a unique product. I look forward to sharing this special Hawaiian Island of Lana’i with you! Sherri Williams is a REALTOR(S) with Hawai'i Life. You can email me at	SherriWilliams@HawaiiLife.com	or via phone at (808) 565-7688.